Here is all you need to know about choosing art for your living room. Living rooms are the core space in a home. It’s that one common square where all the other squares of the housing overlap. Whatever be the style of your living room, formal, informal or semi-formal, its purpose is usually to socialise and interact. Thus it’s the one space in the home that deserves a generous dose of art. It’s a great conversation starter: Art brings with itself many perceptions and interpretations that make it a perfect ice breaker when it comes to conversations. How one interprets a piece of art also speaks volumes about one’s views and ideologies of life. In fact, a conversation about art is a great way to understand compatibility. It adds character to a room: It’s like the finishing touch to your living room. Its colours or lack of it, its texture, definition, and personality adds character to a room and makes it a complete picture.Depending on the kind of art you choose, you can lend a contemporary, classic or fusion look to the living room. It is a window into your personality: Whether you are an animal lover or a nature enthusiast, a fun loving person or a secretive one, have unfulfilled desires or a go-getter, your choice of artwork will define your personality greatly. So choose carefully! Makes a lovely coordinate: One can choose artwork that complements not just the walls of the living room, but also its furnishing. A stunning grey cloud patterned rug goes very well with a monsoon inspired artwork.Or a colourful hand painted cushion coordinates well with an artwork of a villager, or maybe a black and white abstract. Art offers multiple possibilities of mix and match and is a great way to make or complete your decor story. Allows experimentation: Art is the most versatile medium of expression and even within a frame, one can experiment with multiple mediums. Oils, watercolor, mixed media, all work very well in living rooms.Being one of the largest rooms of the house, one can also experiment with sizes, combinations, and paneling to create stories with art. Once you have decided to invest your time, effort and money in the art (good decision! ), and you know how impactful it can be to add that perfect finishing touch to your living room, it’s important to select the right artwork. Identify the right position: The right position of artwork is where it adds value to the room instead of appearing to be a liability tucked in a corner. It has to have visual accessibility and the right amount of light.One must also identify the right orientation depending on the wall you decide to display it on. Contrast or complement: The artwork has to either complement your decor and its colour scheme and fuse with it or completely contrast it to stand out.For example, a white-dominated room can either have a stark black and white painting or a bright orange and red painting. But a room dominated by pinks and purples might not want to go for a red piece of art. Get the right size: Just like an outfit too loose or too tight can make you look unflattering, an artwork which is not the right size can take away from the beauty of the room and the artwork itself.It’s a good idea to measure the dimensions of your wall before you go out to look for artwork. It is also important to measure the sizes of the furniture it is going be placed above or around (a sofa or a console) and ensure that the size of the artwork doesn’t not exceed 2/3rd of the size of the furniture. Choose a piece of art that showcases your personality: As we mentioned earlier, the art you choose defines to a great extent your persona and your taste.So, it’s best to select a piece personally and something that defines who you are, what you believe in and how you view the world. It could be a window to your desires, your inner motives or simply something that you strongly promote. For a wall art size guide, read this informative guide. You can also check out some suitable art for living rooms curated by our team here. Anything and everything can be a piece of art, depending on how we perceive it and showcase it. Mediums of art are endless. It’s not uncommon to see an heirloom or a traditional embroidery to be framed as a piece of art; dried leaves and even baby’s old clothes make it to the walls. However, for living rooms, we recommend canvas art as the ideal kind of art. Representational Art: This kind of art is usually realistic and represents actual subjects from reality. It’s the oldest form of art and is usually sub-categorized into Realism, Impressionism, Idealism, and Stylization. In Realism, one usually creates a truthful and realistic image of the subject, while Impressionism is the artist’s impression of the object depicted with relatively small, thin, yet visible brush strokes. The focus here is on capturing the light right and depicting the essence of the image artfully. Idealism is the reproduction of an idealistic or beautified image of the subject while Stylization is a skilfully stylised version of the actual object. Abstract Art: Abstract art takes subjects from reality but presents them in way that is different from how we view them in reality. Here, artists usually use lines, shapes and colours to transform the subject. The fun part about abstract art is that it leaves a lot to the imagination and allows the viewer to interpret his own version of the artwork, or simply leaves one guessing about what the artist has in mind about the subject. Abstract art includes the subcategories of Minimalism and Cubism. In Minimalism, unnecessary elements of a subject are eliminated to create minimalist forms while Cubism is one of the first abstract styles of modern art where the natural forms of the subject are reduced to their geometrical equivalents. This type of art is commonly mistaken for Abstract art although it is entirely different from it. Non-Objective art takes nothing from reality. Its sole purpose is aesthetics. Once you have chosen your piece of art, it’s time to highlight it in the right way to make it stand out. Lighting: It’s best to choose from ceiling lights, track lights, wall washers and picture lights to highlight your precious piece of art.Experts suggest that ceiling-mounted lights should be placed such that the light beam hits the centre of the artwork when the fixture is adjusted to a 30-degree angle. Track lights are usually the right lights for art work but not the best fit for living rooms since we don’t want something other than art work jutting out near it. Wall washers are a more casual way to light up art work but more suited when there are multiple pieces of art on one wall. Picture lights are the lights that have been used traditionally to highlight a specific piece of artwork. Framing: The most common types of frames are ornate gold, wooden frames, metallic frames and minimalist frames.Ornate gold frames can be used to highlight a simple piece of art elegantly while wooden frames complement wooden or leather furniture well. Metallic frames allow one to pick a colour from the artwork and highlight that in the frame while a minimalist frame lets the art work be the hero and simply provides definition. Positioning: The safest and most common way to position your artwork is in the centre. 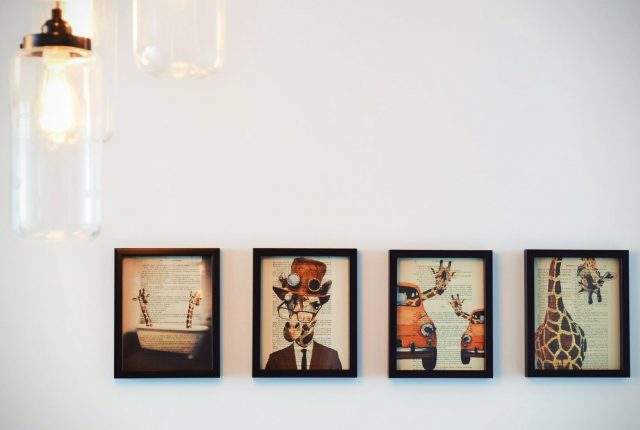 However, if you are in the mood to experiment, try going off centre, but make sure you have something to balance on the other side.If you are looking to display a bunch of art pieces, opt for an odd number and start from the centre. Here are other things that you need to know while selecting art for your living room. Complementing: Artwork needs to complement your decor in all ways. Repetition of colours from the art work in the decor increases its impact in the room.To achieve this, opt for furnishings in complementing colours. Or add flowers or plants. Knowledge: It is important to be updated about the artist of the artwork, his style and to gather as much knowledge as possible about the piece of art you possess. After all, you have many conversations that will revolve around it soon.